106 records – page 1 of 6. 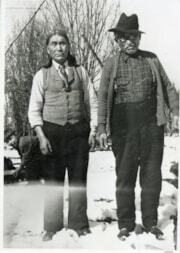 Came from a black photo album. Inside the first page was P2644 and this note "To: Joan Muriel and Allan McGill. With Best Wishes. From the United Church Sunday School. 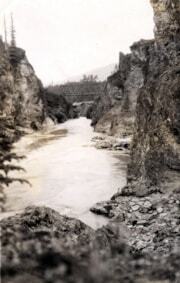 Smithers, B.C. June 30th 1935." Title based on information written on back. 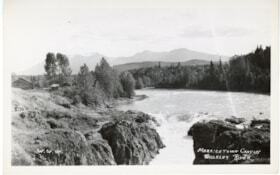 Written in pencil on the back of photo: "Moricetown bridge"
A view of Moricetown from a hill, taken by the donor when he was working on the GTP, 1912-1913. 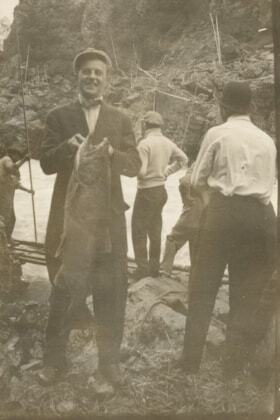 On back of photograph is written: "Luke Fowler (L) a labour [sic] with carpenter crew [?] Moricetown Chief Albert"
1 postcard: b & w; 12.5 x 8cm. 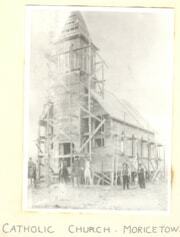 Moricetown Catholic Church under construction. Title based on photograph description. 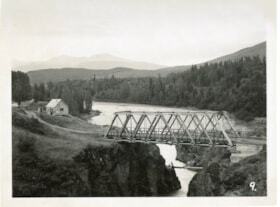 1 photograph: b & w; 17.5 x 12.5cm. 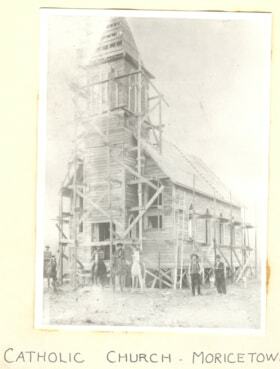 Written on front "Catholic Church - Moricetown under construction - 1912." The church was commissioned by Rev Fr. Godfre with the help of two builders. 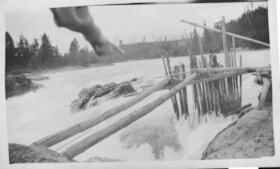 The spruce and birch lumber was hauled from Glen Vowell (Kispiox) mill, run by water power. One builder was George Carpenter. 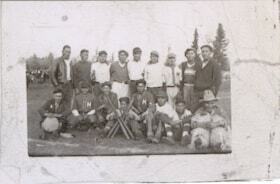 Pictured in the photograph are Arthur Charlie, Seymour Tom, Jim Mitchell, Naziel, and Joe Nass. 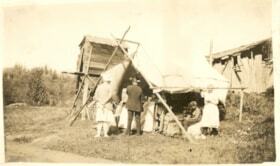 Tent store in Moricetown, B.C. 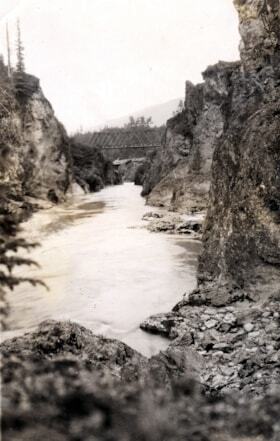 1 photograph: sepia; 10.5 x 6cm. Written on back "A store run by [M. A. Shell?] at Moricetown." 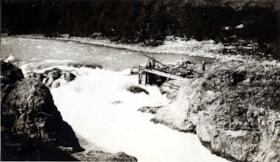 Moricetown falls with a fish trap. 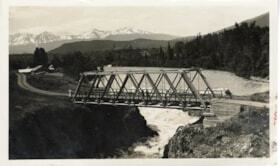 1 photograph: b & w; 11 x 7cm. 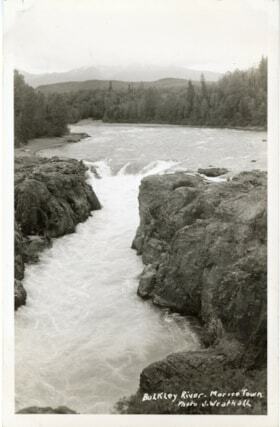 Written on back "Moricetown falls before fish ladders were installed. Early 1920's." David Dennis and Madeline Dennis in ceremonial regalia. David and Madeline Dennis lived at Moricetown. Dennis Lake is named after the family and they worked a trapline. 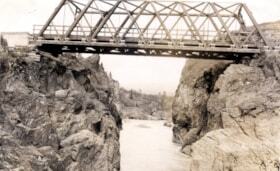 Written above it in blue pen: " From Connie (Hankin)-Cox born in Hazelton. 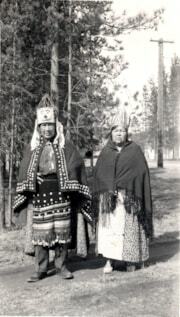 When her father died her mother married Mr. Loring - Indian Agent"
Written on back in black pen "Two more of the dancers (Moricetown) Mr & Mrs Dennis." 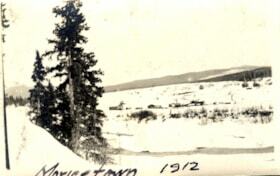 Item is a red tag with "Moricetown Stampede May 30, 1935" written on it with a red string attached. Title based on photo contents and information from "Niwhts'ide'ni Hibi'it'ën: The Ways of Our Ancestors" 2nd Ed. by Mélanie H. Morin. Title based on postcard caption. 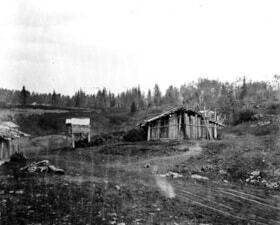 Item is a schematic for a proposed sawmill complex in Witset, B.C.